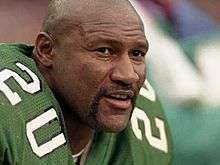 Andre M. Waters (March 10, 1962 – November 20, 2006) was an NFL safety who played for the Philadelphia Eagles and Arizona Cardinals from 1984 to 1995. Waters was regarded as one of the NFL's hardest-hitting defenders, serving as an integral part of one of the league's top defenses. On November 20, 2006, Waters committed suicide in his Tampa, Florida home. Waters was born in Belle Glade, Florida and grew up in extreme poverty in rural Florida, and attended Pahokee High School. As a senior at Cheyney University of Pennsylvania he was recognized as All-PSAC. In 1984, Waters was signed as an undrafted free agent by Philadelphia Eagles head coach Marion Campbell. He returned a kickoff for an 89-yard game-winning touchdown against the Washington Redskins as a rookie in 1984. When Buddy Ryan took over for Campbell in 1986, he welcomed Waters' aggressive style as a fierce tackler and ferocious hitter, earning Waters a position in the starting lineup for the next eight years. He blossomed under defensive coordinator Bud Carson. His tackle of Los Angeles Rams quarterback Jim Everett in 1988 led to a rule prohibiting defensive players from hitting quarterbacks below the waist while they are still in the pocket; for a while, it was unofficially termed the "Andre Waters Rule". NFL broadcaster Dan Dierdorf notoriously nicknamed the Eagles defender "Dirty Waters". He scored a touchdown in 1989 when he took a lateral from William Frizzell after Reggie White caused a fumble by New York Giants quarterback Phil Simms. Waters served as part of the Eagles' defensive unit that was regarded as one of the league's best, in 1991 ranking first statistically in both run and pass defense, as well as total defense. His hard-hitting style translated into leading the team in tackles for four seasons and endeared him with Philadelphia fans but often led to penalties and fines for some of his tackles. He led the Eagles in tackles in 1986, 1987, 1988 and 1991. He recorded 15 interceptions in 156 games. In 1994, he was replaced by Mike Zordich due to his contract ending. After retiring as a player, Waters worked as a college coach at Morgan State University, the University of South Florida, Alabama State University, St. Augustine's College, and Fort Valley State University. He tried unsuccessfully to get a job in the NFL and described his disappointment to a Philadelphia Inquirer reporter in April 2006. He remained very close to his former Eagles coach Buddy Ryan, whom Waters said he tried to emulate in his own coaching career. Waters committed suicide shortly after 1 a.m. on November 20, 2006, according to the Hillsborough County (Florida) Sheriff's Office, dying of a gunshot to the head. He was at his home in Tampa, Florida where he was discovered by his girlfriend. No suicide note was found. Shortly after Waters' death, former Harvard defensive tackle and WWE wrestler Christopher Nowinski, whose wrestling career was ended by post-concussion syndrome and has since written a book about the dangers of concussions in contact sports, approached Waters' family and asked permission to have his brain tissue examined. After receiving permission, Nowinski had samples of Waters' brain tissue sent to neuropathologist Dr. Bennet Omalu at the University of Pittsburgh. Omalu believed, having examined the tissue, that Waters sustained brain damage from playing football: he went on to state that this led to Waters' depression. Omalu determined that Waters' brain tissue had degenerated into that of a 90-year-old man with similar characteristics to those of early-stage Alzheimer's victims that is named chronic traumatic encephalopathy (CTE). Omalu said he believed that the damage was caused and/or hastened by the numerous concussions Waters sustained playing football. Additionally, Omalu said that Waters would have been fully incapacitated within ten years. The NFL declined to comment on Waters' case specifically. A member of the league's mild traumatic brain injury committee, Dr. Andrew Tucker, said that the NFL was beginning a study of retired players in 2006 to examine the more general issue of football concussions and subsequent depression. ↑ "'Football killed him': The legacy of Pahokee's Andre Waters". Retrieved March 18, 2013. ↑ "Esteem Alum Andre Waters Passes Away". Retrieved March 18, 2013. ↑ Thomasi McDonald (2006-11-20). "Former NFL player, St. Aug's coach dies". News & Observer. Archived from the original on September 22, 2008. Retrieved 2006-11-20. ↑ nytimes.com, "Expert Ties Ex-Player's Suicide to Brain Damage"